Walk in the path of The Prophet (PBUH) with a sojourn from Makkah to the holy city of Madinah, beholding the final resting places of Mohamed (PBUH) and Muslim martyrs. 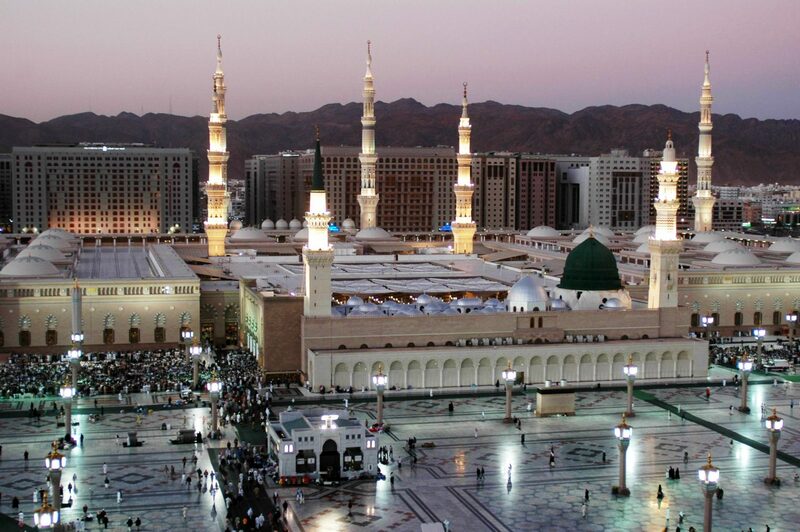 Following in the footsteps of The Prophet (PBUH), you journey from Makkah to the city of Madinah. Mohamed (PBUH) trekked to this oasis under threat of assassination, and soon after established Al Masjid Al Nabawi mosque. This is your first stop. From humble beginnings, the revered place of worship grew to become one of the world’s largest mosques. Filled with reverence, you contemplate the massive marble-rich structure, taking in a majestic green dome that gleams in the sun. It marks the final resting place of The Prophet (PBUH). You enter the Prophet’s Mosque. Multitudes of worshipers pray amid soaring white columns that rise to inspiring arches. You ease into a stream of faithful moving toward Prophet Mohamed (PBUH)’s tomb, stopping before its silver gates. You greet The Prophet (PBUH) with “”Asslamu Alayka Ayyuha Annabiy,”” asking Allah (SWT) to bestow a reward. You notice tears flowing all around you. But you are careful not to cry, careful not to worship. You remember that graves are to be respected, but they are not places for overt grieving or individual glorification. Back outside, you continue your discovery. First, a visit to adjacent Al Baqi. While no grave markers signal its significance, this cemetery is home to notable martyrs. Let your gaze fall upon the ground that contains the remains of many of The Prophet (PBUH)’s friends and family. Next, a sojourn to Uhud Mountain. Overlooking Madinah, the mount was the site of a famous battle between Muslims and polytheists. The traditional account says Mohamed (PBUH)’s men were poised to win, but put victory in jeopardy with overeagerness. Today, the tale serves as a reminder to remain resolute and patient in the attainment of goals.